Your original comic book art collectibles are an investment, but that doesn’t mean you don’t want to display them at their best with restored logos and colouring – while leaving your valuable originals untouched. With over 20 years of experience in design, illustration and production, we have the skills to do it right. Details of how the work is done are below, but if you’re just interested in seeing final results, we have separate pages for DC, Marvel and Charlton comics. When you’re ready, please contact us. The art is made production-ready with any stains, marks, tears and other flaws removed, and missing art is re-created. Blacks are black, whites are white, and the line art is clear and sharp. Logos are re-created as vector art – clearer and more accurate than pasted-up elements which were often distorted copies of copies. New or alternate logos can also be created or sourced. Trade dress (dates, prices, etc.) are re-created from period-accurate typefaces for the same reasons. This attention to each detail yields final art that is to a higher standard than analog/optical production methods allowed. Colour is added to the digital file, either re-creating the look of the published version, or a new colour scheme can be developed. All work is done to a press-ready standard, meaning no matter where you decide to have your piece printed out, you’ll have crisp artwork and rich, accurate colour suitable for framing. We also supply web-ready images for sharing online. Extract and restore printed material for new publishing collections. Letter and colour covers and story pages for new comics. Design, layout and typeset comics and books for press and ebooks. This art has lost its original logos and trade dress. Someone slapped a photocopy of the logo on it. The paratroopers’ plane was ripped off at some point in the past. Before/After, move the slider left and right to compare. This art has seen better days. The trade dress is starting to lift in places, the rubber cement drying out after 35+ years. And certain parts have tanned with age. Here the art has been restored, leaving only the main figures. All the logos and trade dress have been freshly re-created and laid in behind the figures. 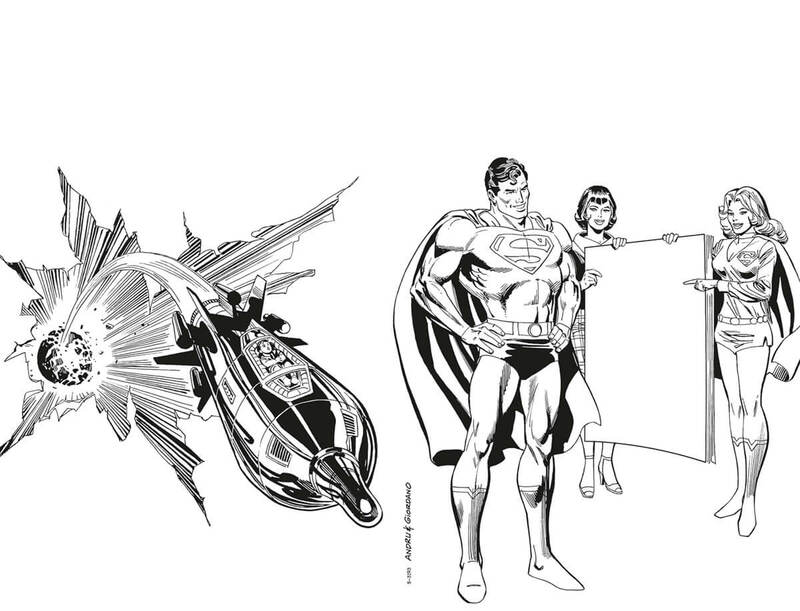 The UPC box (lower left, front cover) has been removed, and the missing part of Superman’s leg has been added. Before/After, move the slider left and right to compare. See the final result. 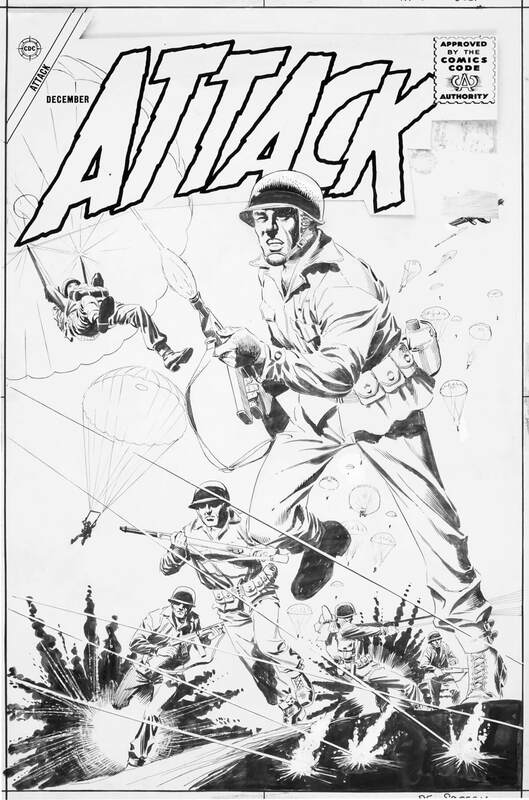 Sometimes, original art is not available, as with this great piece by Nick Cardy from the 1960s. While removing colour from a printed comic is the most-intensive form of extracting line art for reproduction, it can be done. Before/After comparison. In close-up between the cover scan and colour removal. In certain places we’re still left with halftone dots. For the linework, the printing plates of the Sixties made a physical impression in the paper and you can see the ink has been pushed out of the centre of the black lines here. It would not be very noticeable in print due to smaller size, lower contrast and colour behind it. Converted to greyscale, the scan is further manipulated in Photoshop. Then the halftone dots which remain are hand retouched out, and the hollow linework is painted in to restore an appearance closer to the original. This is as good as we can get without original art to scan. See the final result. Trade dress elements are often overlooked. As you can see here, they’re a mix of copies pasted down on the page. 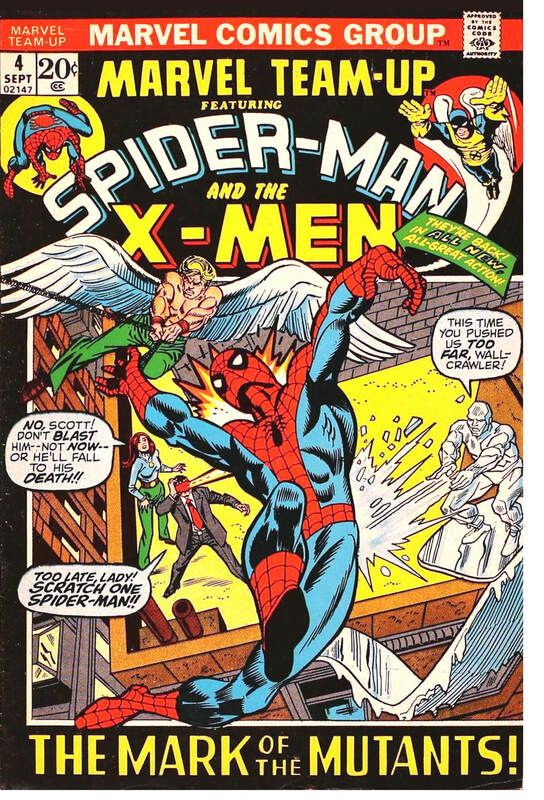 “Marvel Team-Up” is particularly roughly lettered. And of course, the elements have begun to tan with age. When I re-create type that was originally hand drawn, the goal – as I see it – is not to perfectly duplicate the original, warts and all. I try to respect the feel while at the same time bringing consistency and the quality of construction we can achieve with modern tools. The highlighted elements were replaced with vector art. The red items were re-typeset with digital versions of the typefaces used originally in 1972. The black items were hand drawn. Here the published cover is compared with the final colour re-creation in a Before/After. The line work is sharp, the colour bold and you receive the full uncropped art to frame. A new colour version. Whichever path you choose — traditional, modern or custom — we can give you a piece you’ll be proud to display. See the final result. If you’d like to see more work, we have separate pages for DC, Marvel and Charlton comics. Here’s a sample page template you can download and examine. For many – if not most – pieces, the original publishers’ copyrights and trademarks apply, which means you must own the physical art you’d like us to work on. And then, you are limited to printing off a copy to display in your home or office. You are not permitted under copyright law to print off multiple copies for sale or free distribution. These items are for non-commercial, personal use only. If you are a rights holder, then the terms are different. If you own the rights to the work in question and wish to sell copies of it, additional compensation would be required to account for a share of the revenue generated. Designing/packaging books, lettering/colouring stories and so on are subject to hourly or page rates reached through negotiation. These notes are for general information purposes only, and do not constitute a contract.